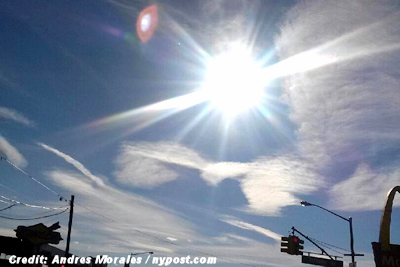 The truth is out there — and it’s hovering over The Bronx. A mysterious light in the sky so freaked out some Hunts Points residents that they called authorities to report their only possible explanation: the arrival of aliens from outer space. A “flying spaceship” is moving swiftly over East 149th Street and the Bruckner Expressway, one terrified woman told a 911 operator Saturday night, according to an FDNY source. Juan Marrero said he, too, had a close encounter. Andres Morales, 25, said he also saw the speedy orb — and did his best to document his out-of-this-world experience. “I stuck my hand out the car window and snapped like crazy,” he told The Post. “I don’t know what it was but it was moving crazy fast.” . . .
Sharon Hill at Doubtful News points out that the sighting was at 11:30 PM but the UFO photo is obviously a daytime shot. The New York Post might not have put there best reporter on this story!